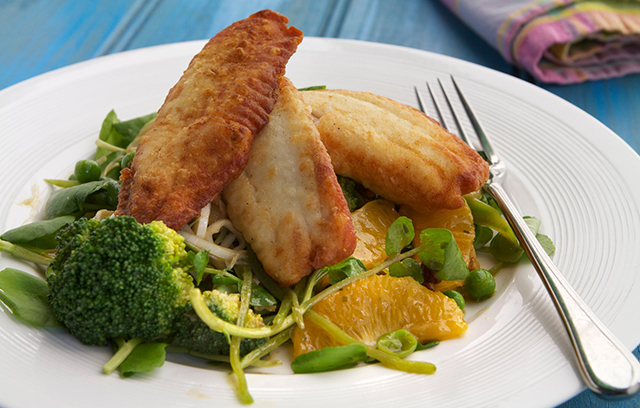 For the fish, sprinkle the flour onto a plate and season to taste with salt and freshly ground black pepper. Dredge the pieces of fish in the seasoned flour until completely covered. Heat the oil in a heavy-based frying pan over a medium heat. Add the fish to the pan, skin-side down, and fry for 2-3 minutes or until crisp. Carefully turn the fillets over and fry for a further 2-3 minutes, or until completely cooked through. For the dressing, segment the orange and squeeze out the juice. Whisk the tarragon mustard, orange juice, sherry vinegar and walnut oil until well combined. Season, to taste, with salt and freshly ground black pepper. For the salad, blanch the broccoli in salted boiling water for 2-3 minutes, then refresh in iced water and place in a bowl along with the remaining ingredients. Add the dressing and orange segments to the bowl and mix until well combined. Serve the fish on top of the salad. 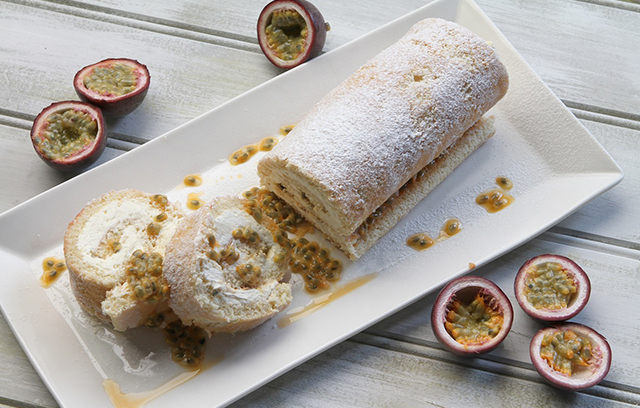 This Lemon and Passion Fruit Swiss Roll is a decadent teatime treat that can be whipped up in no time. Simon has flavoured his roll with rich lemon curd and aromatic passion fruit, but you could use any fruit you prefer, such as raspberries or seasonal blackberries. Preheat the oven to 200˚C/400˚F/Gas 6. Grease and line a 23cm x 30cm/9in x 12in Swiss roll tin. Whisk the eggs, lemon zest and sugar in a bowl until pale and fluffy. For the filling, mix the lemon curd into the cream and then spread onto the sponge, leaving a small gap around the edges. Spread the passion fruit seeds all over the cream. Roll the Swiss roll up from one of the long ends. You can find all the other recipes from the show so far in our Recipes section. This entry was posted in Daily Brunch, Talking Ocado and tagged Channel 4, competition, Cook, Cooking, cooking from scratch, Daily Brunch with Ocado, food, foodie, Global Food, good food, Groceries, home cooking, Ocado, Ocado deliveries, Ocado groceries, ocado.com, passion fruit, Recipes, salad, shopping, Shopping at Ocado, Simon Rimmer, Swiss roll, Tilapia, Tim Lovejoy, TV Chef, white fish, winter salad by Ocado. Bookmark the permalink.